If you've ever been to a science fair, chances are you've seen a model of a solar system. There are a number of ways to construct such a model. One of the best ways to illustrate the solar system is to build a mobile. This allows the model planets to actually suspend in the air, simulating the spatial orientation of the actual planets. Materials for the model, which can be found in craft stores, do not have to be expensive. Take your cardboard circle and draw a straight line from the top to the bottom and another from the left to the right. The intersection point is your center. Place the sharp end of the compass on the center. Rotate the compass to create the orbit of Mercury. This circle should be fairly close to the central point as Mercury is relatively close to the sun. Do the same for Venus, Earth and Mars. Widen the compass for the outer planets. These planets, which are beyond the asteroid belt, have larger orbits than the solid planets. 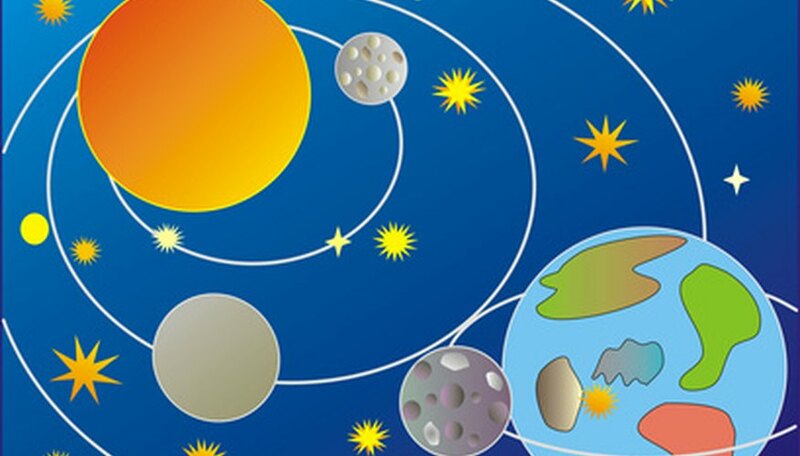 Create orbits for Jupiter, Saturn, Uranus and Neptune. Take your nail and punch a hole along each orbit to mark where the planet will hang from. You will want to spread these out on different parts of the circles so your planets aren't completely aligned. You will also want to puncture a hole in the very center of the cardboard circle for the sun. Take your compass and create circles of varying sizes on the poster board to represent the planets and the sun. You will not be able to make the model to scale and still have all the planets be visible because the sun is vastly larger in proportion to the smaller planets. Just make sure that the sun is the largest, that Mercury is the smallest and that all the planets are relatively sized between those extremes. Cut out all of the planets. Color in the planets using your markers or crayons. Be sure to accurately represent the planets. 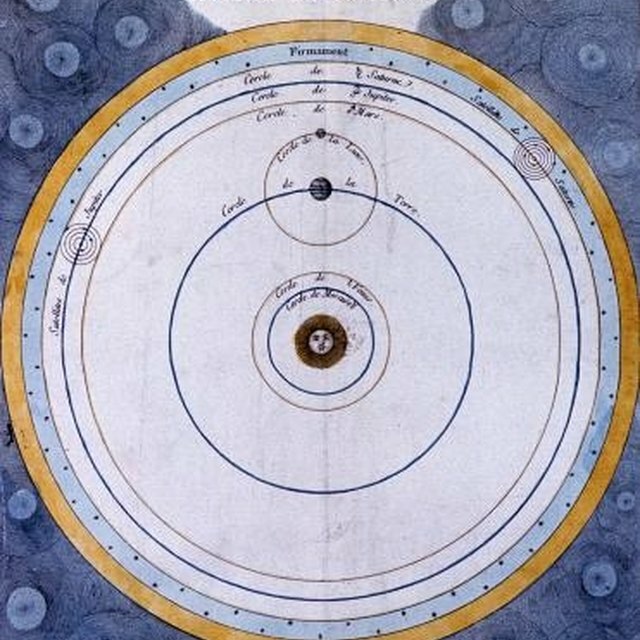 For example, Earth should be blue, Jupiter should have its famous spot and Mars should be red. Take your model of Saturn and place it on top of a piece of poster board. Take your compass and draw a circle slightly larger than the Saturn model. Draw another circle slightly outside of this circle. Cut out this ring, and color it in. These will be Saturn's rings. Affix them to Saturn by wedging the planet model within the rings. If the rings are too large to wedge Saturn into, apply some tape to stick the planet to the inner edge of the ring. Cut strings of slightly varying lengths. You will be hanging the planets from these pieces of string. You don't want them to be all exactly the same length, but they shouldn't be drastically different sizes either. Lengths of between 1 and 2 feet will work. Tape a piece of string to each planet. Lace the other end of the string through the corresponding hole on your cardboard circle. Make three tiny holes on the edge of your cardboard circle. The holes should be equally spaced along the circle's edge. Tie a piece of string of equal length through each hole, and then tie all the ends of the strings together. Then tie these to another piece of string from which to hang your mobile. To get a cardboard circle, simply buy a frozen pizza and save the cardboard. Be careful when using sharp objects such as scissors or a nail. Tabor, Etch. "How to Build a Solar System for a Science Fair." Sciencing, https://sciencing.com/build-solar-system-science-fair-6217837.html. 24 April 2017.